GoNaomi is a very simple software application, that can actually come in very handy, because it will allow the user to translate more than 40 different languages, among which we'll be able to find the most important worldwide as well as Macedonian, Moldavian and Philippine. The interface is rather plain and the program is very easy to use, because by means of a tab system we'll be able to configure the languages that we want to use. 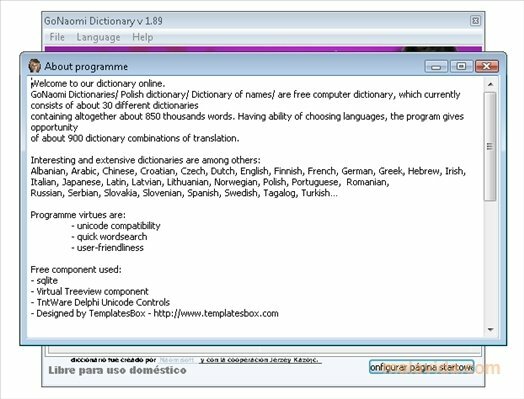 Once we have them selected, we'll be able to search for the word of our choice as long as it's included in the program's database. 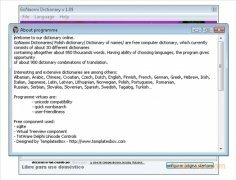 Unlike other developments, this application doesn't translate full texts, it limits itself to using the database to give us the direct translation of certain words. The program is very lightweight and doesn't require almost any system resources, so it's ideal to be used on any computer, even if it doesn't have very high specifications. Download GoNaomi Dictionary and discover a translator that, despite being so simple, can help more than one user to get out of trouble.